When I think of Southeast Ohio, I hear the mental soundtrack of mountain music, the grief-glissade of a slide guitar, the breath caught in the throat before the bridge. I’m back in the sensory world of hills and forests, laid down deep in neural memory, though I haven’t lived there for 35 years. I remember: the trees’ thin-barked muscularity, a beauty almost sensual. Sassafras saplings, wet-black and acrid after a summer thunderstorm. Birdsong — thrushes and vireos, their calls defining the canopy’s height. At night, a pulse of whippoorwills. The leaf-mold must of spring, my boots wading through the ankle-high umbrella-leaves of May apples. I still love those hardwood forests, love them through the living specificities of glade and hollow. But even in childhood I knew something of their histories of damage. In Appalachia both the people and the place have long been treated as disposable. In Appalachia both the people and the place have long been treated as disposable. The dispossession of the Shawnee and Iroquois followed the standard trajectory, theft and slaughter. Some of the first white settlers arrived as indentured servants, their passage paid in return for their labor, a debt extracted year by year. Later, coal miners moved into company housing, received their pay in company scrip, and when the unions organized against wage cuts, families were evicted from their homes, barred even from the gardens they had planted on company land. 1 Replacement workers confirmed the disposability of local men. In the coal-mining fields of Southeast Ohio in the 1870s and ’80s, the owners pooled their money to bring in 500 African Americans (mostly from further south) to break the strikes; they actually called this “colonizing the Negroes.” 2 It’s all the same story. For centuries, white men armed with capital — and mostly living elsewhere — have treated these hills and hollows as a colony, a land-locked province of extraction pried open first with canals, and then with rails laid on cross-ties cut from those hardwood forests. The legacy of chronic, sometimes crushing poverty is the social layer laid across the land’s transformation. Look back into Deep Time, into the mountains before these mountains. Thirteen thousand feet beneath the surface lie the Proterozoic origins of the Grenville Range, mountains of the supercontinent Pangaea. The Grenvilles rose for something like half a billion years at the suture-edge along Laurentia’s collision with Gondwana, lifting stony peaks high above the seas where eukaryotic life had just begun to evolve and blue-green algae were pumping oxygen into the changing air, dropping the carbon from their bodies to the sea floor. At the crest of those mountains, rain and wind chipped at the lifeless granite. Such perspective-shifts can be dizzying. The wonder they evoke can feel like joy; it can, as well, bring consolation. Turn next to trace the prehistory of rivers. Along the deltas threading those old, eroded Grenvilles, seawater washed into the sprawl of swamplands, leaving behind a sulfurous chemical spoor in the muck of rotting proto-coal. The Teays River ran westward from what is now North Carolina. (Today the New River and the Ohio slip occasionally into that ancient course.) Ice-dammed a million years ago, the Teays spread into a finger lake that submerged most of the county where I grew up for 7,000 years, until the waters carved new outlets and the valleys returned to sunlight. If you lay an outline of that Pleistocene lake on a map of abandoned mine sites, you can see a brown smear of thickly plotted mines coinciding with an unsubmerged peninsula that might be today’s Utah Ridge. Not far from there is my hometown of Athens, drowned by re-imagined water. Such perspective-shifts can be dizzying. The wonder they evoke can feel like joy; it can, as well, bring hints of consolation. As the textured landscape blurs beneath abstractions, the present moment shrinks until it almost vanishes. But you can still trace those contours as you travel south across Ohio, crossing the Scioto Lobe of the Pleistocene ice sheet and leaving behind the glaciated portion of the continent. It’s the way I’ve always arrived on my occasional visits home. Along Route 33, the Hocking River snugs close to the highway, following an old railroad siding which served the coal mines. In some places the tracks have been removed and the bottomland put to other uses. One such spot is between Nelsonville and Athens, below the forested heights of Utah Ridge and Coal Run Road, where in my childhood there stood a roadside rest — splintery picnic tables, cinderblock restrooms, a stink of pee. Here, at the turn of the 20th century, the railway fronted New Pittsburgh Mining Company Mine No. 9. Now it’s the site of the Wayne National Forest headquarters. The sharp gray building with a red metal roof — its solar panels laid like high-tech impressions of slate shingles — mirrors the old coal tipple. Historical photographs show the same boxy tower, the stair-tipped wing buildings. Inside there would have been conveyor belts and chutes and screens, a cacophony of tumbling ore, men at long tables to separate out waste rock and sort the coal by size (pea, egg, and lump). The tipple was the last portal through which coal passed before dropping to the hopper car below. Those smudged, half-toned prints record a general haze of coal dust; on the men’s faces, on overalls and boots, in the air. Earlier, hand-drawn illustrations show a different artistic ground. Frank Leslie’s Illustrated Newspaper placed the violent mine strikes of 1884 in a landscape alive with trees and grass. In that drawing, the strike-breaking workers dive for cover, as a guard hired for their protection aims his rifle at a wooded hill above the mine, his shadow darkening the narrow-gauge tracks. Another man runs toward “the friendly shelter of the pit mouth.” 3 It’s not actually a pit mine; I recognize it as a drift mine, the kind where the tunnel heads straight into the hillside following a horizontal vein of coal. What’s unreal is the “friendliness” of this image: the neat, log-walled portal with grass growing on the roof, like a cross between a soddy and a frontier cabin. It’s an idealized scene of human drama. No one has been injured or killed. And there’s no loose litter of mine tailings, no machine- and boot-churned mud, no erosion sloughing from the clear-cut hillsides or sulfured water pooling in the heaps of gob. Frank Leslie’s Illustrated Newspaper, coverage of 1884 mine strikes in the Hocking Valley. Whenever I read the word, I think gob-smacked, punched in the face. Shortly after the opening of Mine No. 9, fatalities started to show up in documents submitted to the Ohio Assembly. Three days before Christmas in 1910, the mine inspector “was called to investigate the death of William Wearn” who “was injured in the No. 3 room … his foot was badly injured, blood poison set in.” The inspector took the opportunity to “make partial inspection” and declared the mine to be in “good” condition, an assessment that could leave a modern observer wondering what criteria he used. 4 One might wish to know more about the death of that miner, who worked in the No. 3 room of the No. 9 mine, and more about his life and others like it. But the human stories written in this landscape are hard to recover. What survives in the public record are bureaucratic reports and balance sheets; calculations about what was extracted, at what cost. History as we know it is a series of environmental assessments. A record of damages. History as we know it is a series of environmental assessments. A record of damages. Mechanized loading came late to Southeast Ohio, but when the machines arrived to speed the conversion of beds to voids, employment plunged. Between 1930 and 1943, at least fifteen of the larger mines in Athens County were abandoned, each one leaving hundreds of men without work. 6 Federal agents began buying up land in the Hocking Valley — cut-over, hill-farmed, mined-out — to create Ohio’s first national forest. To households stunned by poverty, the Civilian Conservation Corps offered reclamation jobs on the new public land, planting seedlings and building reservoirs. You can look at this history from both sides, as a bail-out for capitalists who had treated the land as an industrial byproduct, and as a progressive initiative that sought to develop and maintain an enduring public good. And here, again, irony twists these storylines together with more distant history. The new forest was named after Anthony Wayne, the Revolutionary War officer who went on to destroy the Western Confederacy of indigenous peoples in the Northwest Indian War of 1794. At the final confrontation, the Battle of Fallen Timbers, Shawnee chief Blue Jacket hoped the tangled trunks of a large forest blowdown would impede the United States cavalry. But Wayne and his company were not deterred. They routed the warriors and went on to burn the villages and the crops in the field, completing the dispossession. Some history can’t be remediated. Just upstream from Wayne National Forest headquarters, acid waste sluices into the Hocking River from Monday Creek, one of three major waterways draining the 700-square-mile coal district. Roughly a quarter of that land is underlain by mine shafts and tunnels or strip-mined. 7 In the blitzkrieg chemistry that shadow-steps mining, long-buried sulfides are shocked by sudden exposure to air and water. Iron pyride oxidizes in a cascade of reactions, releasing enough positive hydrogen ions to sterilize waterways. Acid mine drainage cuts through gob piles; it pools in strip mines and roadside ditches; it leaks from abandoned tunnels. When the pH level is low enough, the waste dissolves minerals in the surrounding rock, loading the water with toxic metals. When the pH gets a bit higher, soluble iron precipitates back out as a sludgy solid known as yellow boy, which smothers the streambed’s plant and insect life. A stream that runs yellow or orange is 10,000 times more acidic than pure water. To read about acid mine drainage is to wade into the specialized vocabulary of chemistry, ecology, and engineering. You can hang the names of common liquids on the ladder rungs from acid to base (lemon juice, 2; beer, 4; bleach, 13.5), but even then it’s easy to forget the scale is logarithmic. A stream that runs yellow or orange is 10,000 times more acidic than pure water. Attempts to mitigate acid mine drainage often aim for a stream-flow pH of 6, which is still ten times more acidic than you’d like. At the molecular level, that translates to one trillion times the ratio of hydrogen to hydroxide ions. In a colonial map from 1755, the names of many waterways are unfamiliar — Sandy Creek is Lamanshikola, the Scioto River is Sioto, and the Hocking is given as the longer Hockhocking, a Delaware word describing the bend, like a gourd-neck, where the current left the glaciated plains and twisted into the hill country. Here we find the earliest published mention of Ohio coal. Along the lower Hockhocking, we read: freestone coal’s. Farther northeast, the Muskingum (all gentle and passable by canoes to the Portage at the Head) is also marked with coal’s. 12 Coal appears along a tributary of the Kanawa, in the center of A Vein of Mountains about 30 or 40 Miles right across — the label continues past the stylized relief — through which there is not yet any occupied Path in these Parts. In 1755 it was 80 years before the canals would transport salt and coal, a century before railroads displaced the towboats, two centuries before the interstate highway act. The map records the trackless pause between intention and access. The coal boom, when it came, was relatively brief — two or three generations, in most of the Hocking Valley. The tipples and railroad sidings have all but disappeared, though you can still find company housing on rural routes where miners walked to their jobs underground or, later, to the strip pits. Drivers speed past wooden porches that front the road, almost close enough to touch, next to ditches shin-deep with standing water and acid mine drainage. In Nelsonville, once the valley’s commercial heart, the population has dropped to what it was in the late 19th century. For a while you could see the abandoned shell of the pre-Prohibition brewery from Canal Street, where traffic on Route 33 slowed to creep through town. Even that’s gone now. Sometimes I think land use is like a kind of weathering — erosion, transportation, deposition, on and on. This route avoided some problems — the state was loathe to assume responsibility for cleaning up the toxic landfill and strip mine — but presented challenges of its own. The new road would cut across terrain honeycombed with old mine tunnels, which would have to be backfilled by pumping in a highly plastic cement made with fly ash, flooding the tunnels with artificial stone — a technique called, poetically, “grouting the void.” What’s more, the road would bisect a national forest home to threatened and endangered species — the Indiana bat, the timber rattlesnake, and a butterfly called the grizzled skipper. In order to proceed, ODOT had to win the approval of the Ohio Environmental Protection Agency, in a permit process involving the U.S. Army Corps of Engineers, the Ohio Department of Natural Resources, and the Wayne National Forest — a maze of agency review. 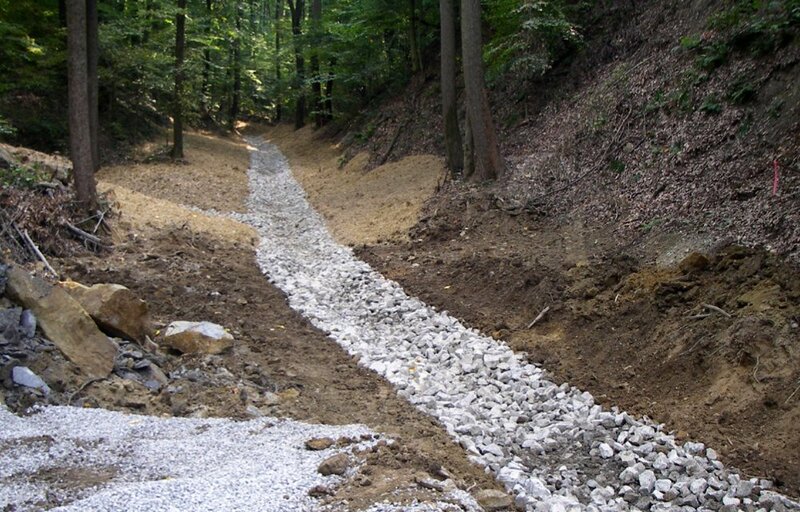 What began as a highway bypass project became part of a watershed-level mitigation effort. Here the history of the Hocking Valley coalfield intersects the legal invention of environmental trading markets, which complicate capitalism by recognizing habitat health and biodiversity as calculable values in land-use negotiations. The concept goes back to the 1960s but went mainstream after the Clean Water Act of 1972. At first “wetland mitigation” was a kind of barter system facilitated by everyday real-estate transactions. Destruction of a protected wetland could be traded for preservation of another wetland of the same size; the developer of the former would purchase the latter as part of the approval basis for the building permit. Federal guidelines also allowed developers to build new wetlands to replace the old, under the principle of no net loss. But this kind of like-for-like swap floats on a fallacy. Equivalence of ecological habitat can’t be measured in acres; ecosystems aren’t tidily fungible. 16 And the piecemeal conversion, one developer’s project at a time, resulted in a lot of small-scale preservation while large tracts of undisturbed habitat — more valuable to biotic communities — kept disappearing. 17 So by the 1990s a more complex economy of environmental protection demanded “functional evaluation methods” for translating ecosystems into credits and debits. Under this new system, transportation officials won approval for the Nelsonville bypass by pledging to work with Wayne National Forest to improve water quality and wetland health. Through these mitigation efforts, ODOT could not only offset the highway project but also bank credits for the right to destroy other habitat in the future. The agencies drew up a detailed “compensatory mitigation plan” that specified how much wetland and waterway — tallied to the third decimal point — lay in the footprint of the proposed highway bed. The compensatory requirements (equally decimalled) calculated the acres of wetlands to be created and restored and the streams to be improved. Parsing these documents, I register the places I knew growing up. In a landscape where umpteen named ridges drop into umpteen named hollows, the place names assigned to restoration projects wobble under their new signifying weight. Happy Hollow has become the Happy Hollow Pooled Wetland Mitigation Area, a mosaic of preserved, improved, and constructed wetland near the mouth of Monday Creek. It stores excess environmental credits, banked away on a balance sheet to offset future construction. Happy Hollow has become the Happy Hollow Pooled Wetland Mitigation Area. The traditional place names wobble under their new signifying weight. Remediation efforts have been ongoing in the Hocking Valley for nearly 50 years. Some of the experimental techniques sound like the stuff of old folk songs: Steel slag leach bed; limestone drains; J-trenches, open limestone channels. Each of these is an excavation filled with material that chemically interacts with the tainted drainage. It’s like a giant spa experience for water itself, where the bath salts are limestone and steel slag brought in from West Virginia and Kentucky. 17 The calcium carbonate in these materials creates an artificial karst through which drainage percolates, gently, I imagine, sloughing off hydrogen ions before it continues onward. But in regions so densely stippled with old mines, the treated water can be contaminated again by another source farther down the watershed. Occasionally, you can hear a human voice in the bureaucratic reports. One of ODOT’s partners is the nonprofit Rural Action, Inc., which coordinates an intensive watershed monitoring effort through the Monday Creek Restoration Project. To get a baseline assessment, staff waded in streams throughout the 116 square miles of the watershed, counting species and sampling water quality. Many sites had pH levels below 4; others had metal loadings in the hundreds of pounds per day. In one report, the typically bland language shifted to reveal a moment of authorial dismay: “The stream actually cuts through a steep bank of gob.” 20 You could almost hear in that actually a slap of the hand to the forehead: God, I can’t believe the stuff we have to deal with. Conditions like these made life impossible for most native species. Acidity below pH 5.5 crushes stream diversity, starting with mayflies and continuing through the food chain to fish. On the Macroinvertebrate Aggregated Index for Streams, nearly the entire waterway scored in the lowest of four categories, “Very Poor.” By state water quality standards, much of the Monday Creek system was categorized as Limited Resource Water, a term given to “small streams that have been altered to the extent that they can support no functional assemblage of aquatic life … irretrievably altered waterways.” 21 And yet the state and its local partners intended to retrieve those same streams. The Appalachian mining songs in the national imagination are mostly from Kentucky or West Virginia. Pete Seeger’s “Which Side Are You On.” Darrell Scott’s “You’ll Never Leave Harlan Alive.” Ricky Lee Skaggs. For the tunnel’s deep, Lord the air gets thin… The fiddle, mournful, shifts into a minor key. The banjo slows its pace from dance to trudge. One of my favorites is a haunting ballad sung by a coal miner’s daughter and labor organizer, Sarah Ogan Gunning. The voice moves from historical summary into a wail of grief and moral rebuke. Because of that twenty-five cents that you paid. It is the nature of the past to always grow larger, with every passing year. Maybe it’s the ultimate renewable resource. You can turn to the past to find almost anything. It’s the future that’s uncertain; it might hold nothing for you. Lost Run, Rock Run, Big Four Hollow, Coe Hollow: treatment sites named for the tributaries they’re meant to salvage. Anglo-American words attached to the land after the Shawnee had been run out or slaughtered. These four — among dozens in the larger effort to restore damaged waterways in the Hocking Valley Coal District— were funded by ODOT as part of the bypass mitigation work. Other agencies are responsible for similar efforts. In Jobs Hollow, where deep mine seeps and gob piles fouled tributaries high in the hills, the Ohio EPA scooped out a retention pool and built a Successive Alkalinity Producing System to steadily apply controlled amounts of lime. Another SAPS — or “doser,” as they are called — was placed farther down in Monkey Hollow. The conversational name makes these systems sound small, like a hospital cup with pills, but a doser is a cylindrical tower like a grain silo holding tens of tons of calcium oxide. Each one costs several hundred thousand dollars. You can turn to the past to find almost anything. It’s the future that’s uncertain; it might hold nothing for you. The goal of all these mitigations is to decrease specified loads, by weight, of acid and metal in the waterways. The targets seem gutsily ambitious — sometimes as high as 100 percent. At Lost Run, an initial limestone leach bed failed; surface runoff clogged the system and caused untreated water to flow around it. 24 After three years of disappointing results, the leach bed was abandoned, like the other landmarks on the topo maps: Abandoned Mine, Abandoned Railway. In official reports, treatment systems are sometimes labeled defunct. Even in the restoration business, sometimes you have to cut your losses and move on. Adjacent to the Happy Hollow mitigation tract is a parcel called the Rardain Restoration Wetland. “Rardin,” it’s pronounced in the local accent. Growing up I knew neither Rardains nor Rardins, but both families have lived in Southeast Ohio coal country for well over a century. An early state history traces the Rardin lineage back to two brothers, Denis and John, who came to the Colonies from Ireland in 1750. 28 They seem to have acquired property in the Northwest Territory through service in the American Revolution, which gave them both stability and opportunity — a foothold plus a leg up in their new world. The Rardins were among the first European immigrants to enter the Appalachian foothills beyond the Ohio River, where they began converting trees and soil to personal wealth. Unlike the coal and timber barons, who lived mostly elsewhere, the Rardins settled and began raising large families. Denis’s descendants were major players in Athens in the early 20th century, as the county seat grew from 3,000 to 7,000 people in the span of a generation. The Rardin Brothers ran a lumber yard and a cement and pipe supply company, and soon they became real estate developers with dozens of houses for rent and sale all over town. They bought a school furniture factory; they started the town’s first steam laundry and dry cleaning business; they even manufactured caskets, running ads in the paper touting the endorsement of the trustees of the town cemetery. They shaped workers’ lives from the house to the grave. In 1912, they sold a prime lot near the railroad to then-tiny Ohio University, which caused a stir in the state attorney general’s office about whether they had clear title to the land. One brother, E. H. Rardin, ran for mayor; a sister, Addie Maye, founded the Central Avenue Methodist Church; another brother, Dan, traveled to Washington, D.C., in an attempt to have himself named postmaster of Athens. But the Rardain Restoration Wetland is not named for these Rardin Brothers. The spelling distinguishes another family altogether. In 1930, George Rardain was born in the tiny settlement of Orland, near Happy Hollow. Today Orland is just a place name at a crossroads, but mapped within a mile of that rural intersection lie a handful of abandoned mine sites; within five miles the number climbs to more than 40, scattered along the Raccoon Creek watershed. At the crossroads itself, a gob pile reclamation was completed in 2012. Based on the evidence, George Melvin Rardain was born in a mining camp. His people, too, came from coal country. His mother, Mabel, was from the company town of Haydenville, one of six surviving children from the nine born to her parents, who were themselves born, raised, and married in Haydenville, and “made their home in Dorr Run,” just over the next ridge from Happy Hollow. 32 On the paternal side, there were Rardains in Vinton County since at least the 1870s, though it’s not always clear which were related to George. In a 1915 newspaper, I read: “Henry Rardain, 26, miner, Carbondale, licensed to wed Effie Carr, 23, domestic, Nelsonville.” 33 Thirty years later, an article announcing the reopening of the Kimberly Mine after a strike names Henry as the secretary of the UMW, Local No. 8465. 34 The Kimberly was six miles south of Happy Hollow, across the Hocking River. In the home Henry and Effie made in Nelsonville they raised two children; their son Bob returned on his furloughs during WWII and their daughter Ida lived there, with her husband, in the heart of the Depression. The house itself, a few blocks from the downtown square, occasionally served as a polling place for school bond elections. These names and dates and places reduce lives to data points, entries on a genealogy that’s not my own. Still, I track them down, sifting through old newspaper stories, reading online histories. The Rardin Brothers’ lumber business finally closed — in a sale by auction — the year my family moved to Southeast Ohio. But Rardins built houses and lived in the neighborhoods surrounding my elementary school, and with a shock I discover that one of them — Raymond, who I think was Charles’s son — raised his family on the very street where we lived, a few years before my time. And the other family — the Rardains — I suspect they were the second-cousins-not-so-much removed of kids I went to high school with, the ones whose uncles or fathers still worked in mining in the 1970s, whose grandparents lived in the boomtowns’ clapboard houses, or way out in the county with no indoor plumbing. Some kids rode the bus for nearly an hour and showed up in the winter still smelling of smoke from a fire. These names and dates and places reduce lives to data points, entries on a genealogy that’s not my own. Near the junction of Route 33 and Happy Hollow, George and Dorothy Rardain owned a small but healthy wetland that fed the regenerating woods. The forested hillside was terraced and pocked by low-technology mining — dogholes and drift mines. In the mid-1980s it had been leased to an oil and gas prospector. It stood adjacent to a property that was once a dumping site for mine waste, and which ODOT purchased to use as a staging area for temporarily storing debris from the construction of the Nelsonville Bypass. An old railroad embankment left vernal pools that gathered late-winter water and low-lying pockets that held moisture through periodic drought. It was an industrial corridor in the process of rewilding. All that changed in January 2011, when an embankment failed during construction of the Nelsonville Bypass, threatening a nearby waterway. A design to re-stabilize the land was submitted for multi-agency review and, in the meantime, the contractor obtained the Rardains’ permission to access their land. As the days slipped by, the contractor decided to undertake some temporary erosion control in preparation for the larger job. The timeline was forced by a regulatory deadline: any trees would have to be felled by April 1, before the Indiana bats awoke from their underground hibernation to seek the loose bark of mature trees for shelter. In the final days of March, the contractor had part of the site clear-cut. The Rardains had allowed it, but the logging was a permit violation which now would require further mitigation. ODOT approached the Rardains to purchase the property outright: 3.756 acres for $11,500. 34 A belated environmental survey spelled out what was lost — a Category 3 wetland — and the EPA imposed a restoration process that involved planting more than 400 new saplings, followed by years of monitoring to remove non-native species. Ultimately the restored parcel was legally tied to the Happy Valley Pool Wetland Mitigation Area, near the mouth of Monday Creek, protected in perpetuity. I want a sense of symmetry as I trace these histories. Women from both families appear frequently in the social sections of the newspapers, as club officers and party hosts and reunion attendees (in Outsville, Ohio for the Rardains; in Athens or Parkersburg, West Virginia for the Rardins). I think it’s charming, the way trips out of town, or visiting guests, or matters of health appear in those old newspapers, almost like contemporary posts on social media. Lillian Rardin suffered from sciatica; Ida Rardain Linton hosted a party for her parents’ anniversary. Addie Maye Rardin traveled to Los Angeles to spend the winter visiting her brother, E.H., who was living there. D.A. Rardin was often in Parkersburg or Marietta on business. But just as often, the storylines diverge. The businessmen collect capital and store it in real estate while the workers live in company towns, laboring till their health breaks down. I can’t be sure the Haydenville Rardains are really kin with Henry and Effie, who seem to have spent their entire married life in Nelsonville. Henry’s obituary identifies his parents as Catherine and John Rardain, but almost all I can find of them is a 1926 divorce notice, citing Catherine’s adultery, from the newspaper in Logan, where George and Dorothy lived. I can’t locate any familial connection between Henry’s rise in the UMW and George’s birth in a mining camp, when Henry would have been about 40. Was there another, unrecorded rift in the family? Or are they bound only by name and not by blood? Nor can I find much on the family of Effie Carr Rardain — Henry’s wife, who was a “domestic” at the time of their engagement. A census says she was born in Indiana; how did she, a young, single woman, wind up working in Nelsonville? In 1940, the newspaper reported that two of her brothers had come from Indiana for a visit. What was their story? One of the brothers, Caleb, or a boy who shared his name, shows up on the 1910 census as a “servant” in the household of Granwitt and Laura Christenbery, in Greene Township, Indiana. He’s the only Caleb Carr from the entire state to show up in that census, so I think it must be him. He was then sixteen years old, working as a “farm laborer.” Were the Carr children orphans, working in the precarious shelter that echoes the indentured servitude of earlier decades? I scour the records but find no other promising matches. Effie’s busy homemaking in Nelsonville — at the address on Adams Street that shows up in so many notices of club activities and hosted parties — comes to seem fiercely poignant, undercut by a familial void. George Rardain died in 2017 in Logan, Ohio, the town where he and Dorothy spent their nearly 60 years of married life. His obituary notes, simply, “He worked for the Logan Pottery Company and Harwood Construction in Logan … before retiring from the City of Logan Water Department.” The details seem like darker reflections of the businesses run by his counterparts, the Rardins— first that cement and pipe plant, then the real estate developments, all those houses in Athens. And there’s George’s involvement with water, years before the wetland restoration. It seems unreal, the plotline of a 19th-century novel. Unlike the stories about the Rardins, noting their high positions — general manager, president, first vice president, owner — George Rardain’s obituary simply acknowledges the fact of his employment, seeming to reinforce the divide between landed and laborer. But it turns out that George and Dorothy were landholders, too, owners who supplied water to a rural neighborhood, a business they had taken over from Dorothy’s father. Protection and perpetuity are filtered through laws and regulations, deeds and practice. They seem like quite imperfect concepts. So let’s turn back to Monday Creek. The Rardain Restoration Wetland abuts another 80 acres still owned by the family. Over the years George and Dorothy leased that land for oil and gas exploration, carved out a plot or two for direct sale, sold easements for a driveway and for laying pipe. And, of course, they sold the easement that ultimately led to the clear-cutting and the restoration. There are small family holdings like this all throughout the Hocking Valley. Protection and perpetuity are filtered through the social networks of laws and regulations, deeds and practice. They seem like quite imperfect concepts. 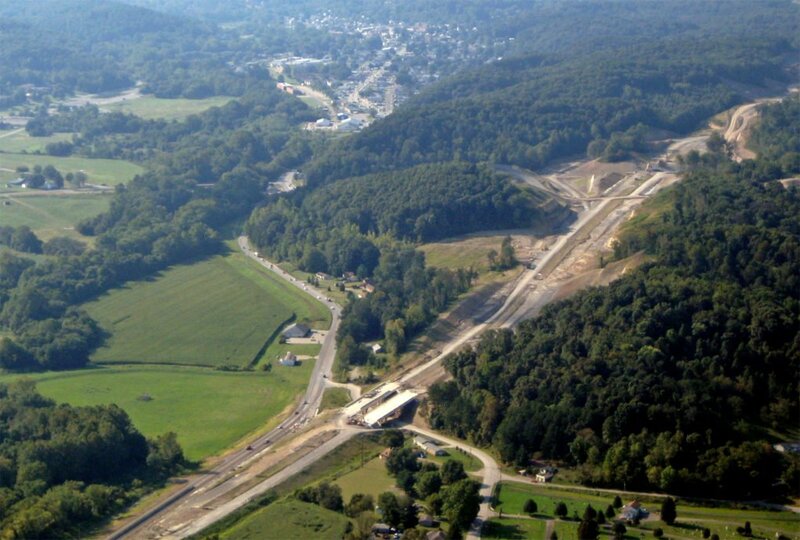 The Nelsonville Bypass opened five years ago, and the mitigation projects are older than that. I am awash in numbers that settle out on my desk. Total remediation expenditures to date: $7,197,808 on Monday Creek and its tributaries, $2,618,273 on Sunday Creek, $14,521,361 on the longer, winding Raccoon Creek. 37 When it comes time for a reckoning, who can say whether these figures are large or small? Other numbers, the ones that register non-dollar costs, rebuke the history of bottom lines. Baseline measurements collected in 2001 show what “irretrievably altered” looks like. Syntax breaks down from the rasp of revelation. God, I can’t believe the stuff we have to deal with. By 2016 all these markers had improved: Sunday Creek met the target pH along 99% of its length, Raccoon Creek was up to 94%, and deeply damaged Monday Creek had reached 70%. 38 Many stretches of Limited Resource Waterway were upgraded to Warm Water Habitat. What the chemistry measures is an improving substrate for life, and the biotic communities are also coming back. Two species of mayflies were found in Raccoon Creek, and Monday Creek monitors have celebrated the return of fish species not seen for generations: Brown Bullhead, Greenside Darter, Spotted Sucker, and Longear Sunfish. How do we reconcile the landscapes we know by heart with the ones battered by industry and then reengineered? How do we reconcile the landscapes we know by heart with the ones battered by industry and then reengineered? There is the Happy Hollow I remember from my childhood. Then there is the Happy Hollow Pooled Wetland Mitigation Area, where each of the four shallow ponds is assessed twice, on the Amphibian Index of Biotic Integrity and the Vegetative Index of Biotic Integrity, 39 and where wood and pickerel frogs, marbled and spotted salamanders, red-spotted newts, and fairy shrimp have entered the tallies, living and breeding in the restored habitat. Farther up the watershed, the Department of Transportation bought 3,300 acres from the former Sunday Creek Coal Company, attached a conservation easement to the title, and added the acreage to the mitigation balance sheet. 40 Did anybody notice? This is how environmental restoration works in modern America, through a series of obscure land swaps under the auspices of a highway project. It’s a strange way to make things right. Like the pools at Happy Hollow, the Sunday Creek Coal acres are intended to be preserved “in perpetuity.” Tony Durm, who manages the Nelsonville Bypass for ODOT, told me his agency’s strategy was to look for partners who had plans to improve the watershed but lacked funding. “It turned out a win for everyone,” he said. I admire his optimism. Now that ODOT has completed five years of mandatory monitoring and tallying and reporting, it hopes to transfer ownership of the conservation lands to an agency with a mission of resource management. The highway builders would keep their balance sheet of environmental credits — a precise summary of acreage preserved, restored, and created, as well as 116,722 linear feet of stream channel preserved — while surrendering ownership of the lands. 41 They haven’t found a willing partner yet. The National Forest won’t accept land encumbered with a conservation easement; meanwhile, the state EPA requires the easement be attached. 42 That leaves the Department of Transportation as the uncomfortable guardian of these recovering hills and streams, perhaps in perpetuity. On my last visit home, I hiked up Wildcat Hollow, a popular National Forest trail in the Sunday Creek drainage, a few miles east from all the mitigation work connected with the bypass. A couple of times I left the main hollow, bushwhacking into side ravines choked with undergrowth, pushing my way through greenbrier and sassafras. It had been years since I’d moved through an Appalachian forest in autumn, and I wanted to get into the wrinkled complexity of the terrain. For a while I walked directly in the streambed, jumping from stone to bank to fallen log. Sapsuckers hammered in the trees. After a bit I came in sight of open sunlight: a clear cut on the ridge top and blaze orange signs warning away trespassers. This is how environmental restoration works in modern America, through a series of obscure land swaps under the auspices of a highway project. It’s a strange way to make things right. At a low crossing on the main trail, I ran into a young couple in fleece jackets heading to the stream for water. They’d be camping two nights, they said; I could see their tent just around the bend. Where we stood chatting, shafts of autumnal light reached through the forest to the floor. The air smelled good, like dry leaves warming in the sun, and the shallow water looked clear. A hawk called through an uncertain distance. Were they worried, I asked, about mine drainage? Well, yeah, a little. They said they were going to filter it and treat it with iodine. The guy held out the new filter, half unwrapped, as if to reassure all three of us. As I moved on alone, I wished that I’d planned ahead, made time to spend just one night on the trail — I had no idea when I might be back again. I have thought a lot about the right verb for such activity. It’s not simply the engineered opposite of all those years of extracting, mining, pumping, all the long-shrouded stuff of ancient photosynthesis. Carbon sequestration plans are breathtakingly ambitious. They aim to mitigate centuries of damage from both the past and the anticipated future. These projects seem to me devoid of humility. How can the language we use add ethical texture, connotative light and shading? Should we say, to cache? To inter? Inhume, I decide. That’s the verb I’ll use, at least in my own thoughts. The word holds ancient wisdom: the etymological base of both Earth’s humus and our own selves — humans — is the same ancient phoneme. Our bodies that evolved on, and of, the body of this Earth; our species that casts its name across the geologic imprint of a threshold already — irrevocably — passed. Steven Stoll, Ramp Hollow: The Ordeal of Appalachia (New York: Hill and Wang, 2017). Warren C. Whatley, “African American Strikebreaking from the Civil War to the New Deal,” Social Science History 17.4 (Winter 1993): 525-58. Douglas L. Crowell, History of the Coal-Mining Industry in Ohio (Columbus: Ohio Department of Natural Resources, 1995), 89. Ohio General Assembly, Annual Reports for 1908 made to the Seventy-Eighth General Assembly in Regular Session of the State of Ohio. Pt. II (Springfield Publishing Co., 1909). After floods on the Monongahela in 1907, The Wheeling Daily News editorialized, “Twenty years ago two inches of rain would have done little else than make a big river. Today it caused the second largest flood in the history of the valley. The barren hillsides are responsible for it. There is nothing to hold the water back. The river has become little more than a sewer.” Quoted in Christopher Johnson and David Govatski, Forests for the People: The Story of America’s Eastern National Forests (New York: Island Press, 2013). For more on the Weeks Act and the early national forests, see William E. Shands, “The Lands Nobody Wanted: The Legacy of the Eastern National Forests,” in Ed. Harold K. Steen, The Origin of the National Forests: A Centennial Symposium (Durham: Forest History Society, 1992). Irwin V. Shannon, “The Social Effects of Mechanization in the Coal Mining Industry in Southeastern Ohio,” Material Culture 36.1 (Spring 2004): 43-58. Mary W. Stoertz, Heather Bourne, Christa Knotts, and Matthew M. White, “The Effects of Isolation and Acid Mine Drainage on Fish and Macroinvertebrate Communities of Monday Creek, Ohio, USA,” Mine Water and the Environment 21 (2002): 60-72. Darrell Kirk Nordstrom, Charles N. Alpers, Carol J. Ptacek, and David W. Blowes, “Negative pH and Extremely Acidic Mine Waters from Iron Mountain, California,” Environmental Science and Technology 34.2 (2000): 254-258, http://doi.org/fkbp5p. Such practices were finally prohibited in 1977, with the passage of The Surface Mining Control and Reclamation Act. Bruce E. Underwood, Natalie A. Kruse, and Jennifer R. Bowman, “Long-Term Chemical and Biological Improvement in an Acid Mine Drainage-Impacted Watershed.” Environmental Monitoring and Assessment 186.11 (2014): 7539-53, http://doi.org/f6kznp. See Robert D. Orciari and William D. Hummon, “A Comparison of Benthic Oligochaete Populations in Acid and Neutral Lentic Environments in Southeastern Ohio,” Ohio Journal of Science 75.1 (January 1975): 44-49; Michael S. Gallaway and William D. Hummon, “Adaptation of Cambarus bartonii cavatus (Hay) (Decapoda: Cambaridae) to Acid Mine-Polluted Waters,” Ohio Journal of Science 91.4 (September 1991): 167-71; and Frank J. Horvath and William D. Hummon, “Influence of Mine Acid on Planktonic Rotifers,” Ohio Journal of Science 80.3 (May 1980): 104-07. Facebook page for the Hockhocking Adena Bikeway. David Meyers, Elise Meyers Walker, and Nyla Vollmer, Carrying Coal to Columbus: Mining in the Hocking Valley (Charleston: The History Press, 2017), 16. Interviews with Tony Durm, District Environmental Coordinator, Ohio Department of Transportation, October 2015 and April 2018. James Salzman and J. B. Ruhl, “Currencies and the Commodification of Environmental Law,” Stanford Law Review 53.3 (December 2000): 607-94. Eric D. Stein, Fari Tabatabai, and Richard F. Ambrose, “Profile: Wetland Mitigation Banking: A Framework for Crediting and Debiting,” Environmental Management 26.3 (2000): 233-50, http://doi.org/b57ghp. Ohio Department of Transportation, 2015 Permit Compliance Report and Revised Mitigation Plan, Nelsonville Bypass, Part I. Interview with Matt Perlik, Assistant Environmental Administrator, Ohio Department of Transportation, November 2015. Ohio Department of Transportation, 2015 PCR, Part II, 56. Chris O. Yoder and Edward T. Rankin. “Biological Criteria for Water Resource Management,” in Ed. Peter C. Schulze, Measures of Environmental Performance and Ecosystem Condition (Washington, D.C.: National Academy Press, 1999), 238. Ohio Department of Transportation, 2015 PCR, Part I. See this fact sheet on the Essex Doser, from the Ohio Watershed Data project. Kenneth C. Carroll, Dina L. Lopez, and Mary W. Stoertz, “Solute Transport at Lowflow in an Acid Stream in Appalachian Ohio,” Water, Air, and Soil Pollution 144.1-4 (April 2003): 195-222, http://doi.org/bwbjwd. Interview with Nate Schlater, Watershed Coordinator, Monday Creek Restoration Project, April 2018. Charles B. Galbreath, History of Ohio, Vol. V, (Chicago and New York: American Historical Society, 1925). Athens Daily Messenger, December 26, 1911. Athens Daily Messenger, February 10, 1938. Athens Daily Messenger, October 3, 1901. Athens Daily Messenger, December 16, 1915. The Sunday Messenger, October 21, 1945. The Athens Messenger, October 20, 1971. Athens County Warranty Deed Book 457, page 2462. Figures from the Ohio Watershed Project at Ohio University. Ohio Department of Transportation, 2015 PCR, Part I, 82. Sophie Yeo and Rosamund Pierce, “Analysis: Negative Emissions Tested at World’s First Major BECCS Facility,” Carbon Brief, May 31, 2016. How do you solve a problem like Maria? An environmental writer reflects on how stylized, color-corrected representations of nature shape our landscape aesthetics. Elizabeth Dodd teaches creative writing and environmental literature at Kansas State University. She is an editor at Terrain.org and author, most recently, of Horizon’s Lens.